Newsgur USA: They keep cutting off dreams from "the dreamers"
They keep cutting off dreams from "the dreamers"
It is quite hard to dream when you got nothing. It is quite hard to dream when you arrive at a land where your pockets are empties and neither work nor families can help you to your economic situation. That was the way of thinking of Carlos Montenegro (fiction character) when he arrived to the United States of America. But he doesn't stop dreaming. He started to work as a bartender and waiter at restaurants and bars. Double labor time: noon and midnight. No matter what he will get his goals, to have a bachelor degree. After he took a low bachelor degree registration and now he is one step of accomplishing his dream: to be a professor at Arizona's University. But this is not only the story of Carlos Montegro, but that of 2300 Arizona public university students who benefited from the Deferred Action for Childhood Arrivals (DACA) program. Now, they will now have to pay hundreds of thousands of dollars because they no longer will receive their discount, according to what was established by DACA but that after the decision of the supreme state court will be suspended. Unfortunately, after that dictation of the State Supreme Court, students protected by DACA can no longer receive federal loans. They only have the possibility to be accepted or be chosen by private scholarships from entities like TheDream.US and Golden Doors Scholars, which give the “dreamers” the opportunity to keep on dreaming. They are called dreamers because of the unsigned law DREAM-Act, the acronym for Development, Relief and Education for Alien Minors Act and also known as the Dream Act (S.1545) or the Dream Act, it is a legislative project that would give a path to US citizenship to undocumented students who would have arrived in the United States when they were minors. Thanks to this bill, undocumented students would be prevented from paying similar fees to other resident students, besides helping to obtain a temporary residence visa and even aspire to a permanent legal residence. But the Dream-Act has many opponents in Congress and in the United States, the first of them, Donald Trump, who has sought all the necessary ways to suppress and retain the dreamers as well as the bill that was never approved. Carlos Montenegro, in order to not to lose all these years of hard studies and his money, has had to resort to the help of donors and charity organizations. He is a senior student and he is confident that he will finish his studies. But will other student dreamers do it? This should be the question that the federal government of Arizona and that of the United States should make before suspending a program that supports young people who are trying to achieve a future. Are not they pushing these young people into the streets? Are not they pushing them to commit criminal actions? Would not the United States be a greater nation if they would offer study options to migrants? But no, that's not Donald Trump's government plan. It is quite the opposite. To reinforce immigration laws and policies to force in the first place the cessation of emigration to the United States, and secondly to maintain the social status of migrants, condemned to less remunerated minor jobs that almost any American native wants to perform. The alleged human rights and dreams to be fulfilled defender nation, and what is worst, most of the migrants really believe it, is not consistent with the ideal it professes. It is hard to say but the United States’ government wants to make life impossible for migrants. The court's decision to suspend the fees’ reduction confuses the dreamers studying at the University of Arizona. They do not know what decision to make. Their lives are torn between leaving the state and seeking other funds. While students seek a way to finance their studies, the Arizona government is divided into two ways. On one hand, some experts believe that universities should not grant discounts to people with irregular migration status, while others consider that they do. Previously, in 2013, the Maricopa district was sued on the grounds of violating a 2006 rule that states that people with irregular immigration status should not receive aid. But the matter has been settled by the State Supreme Court ruling that state and federal laws do not allow DACA beneficiaries to obtain reduced enrollment due to their irregular status. However, this does not stipulate that undocumented immigrants cannot attend public universities. The National Conference of State Legislatures says that 20 states offer reduced enrollment to unauthorized immigrants, among them California, Kansas and New York. In Hawaii, Michigan, Oklahoma and Rhode Island, reduced enrollment is authorized through state university systems. 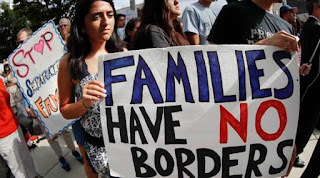 The chaos that caused the immigration issue in the Republican legislators’ block days ago reveals the magnitude of the risk the party is at, much in need of unity and ahead of the November elections in which it will be decided who controls the Congress. While this is happening, the positions regarding emigration could define the number of Republican and Democratic seats. There are those with stronger positions and there are the Democrats who long for a project that would allow the dreamers to remain in the country. And although until next June it will not be defined which of the positions will prevail, Carlos Montenegro and other fellow students will remain uncertain about their future.